unlike this guy, who just Walks. Plug in the iron– set it to cotton. Ironing makes hemming tremendously easier. Put the pants on with the shoes that you think you’d wear with them. Roll them up to where you want the actual final hem to be- mark it with chalk or a pin. You only need to do this on one leg. Take pants off and lay flat- both legs together, flat; one on top of the other. From where the Mark is, take a ruler and draw a straight line AT THE SAME PARALLEL ANGLE AS THE CURRENT HEM. This may not look straight to you, but the pants are cut a certain way– keep the angle, whatever it is. 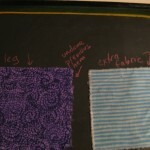 So you measure down, towards the current hem, 1.5″ and make new marks- make about 3 or 4 of them, and then draw a new Line, Still Parallel to other Line and Current Hem- hitting as many of the 3 to 4 new marks as you can. This New Line is where you Cut. If your scissors are good enough, cut both legs at the same time- that way if they get all funky-like, at least both legs will be that way. If your scissors aren’t good enough, then cut the leg with the line, then use the scrap you just cut off as a guide on the other leg. Now you have unhemmed pants that are 1.5″ too long. yey. You take your ruler or Hem Guide (black and silver measurer thing with a sliding blue triangle?) and with the pants inside out, fold hem at 1/2″, pinning every 2 or 3 inches along. You will be pinning to the inside (wrong side) of fabric, so, folding fabric towards you. USING ALL METAL PINS IS EASIER! Do that to both legs, and lay pant leg flat and iron directly over hem. DO NOT “run” iron along fabric- the pins *will* scratch iron’s surface. Lift and Press. Lots of steam helps. If you are using pins with plastic balls, don’t iron over them- the plastic *will* melt and get very icky. Iron until hem is creased to the point where it will stay without the pins in place. Fold over hem one time, and pin again. You shouldn’t need to measure again- you know it’s a 1/2″. Folding up one more time now means you have your 1″ of fabric folded up in the hem. Iron the new folded hem. If it will not stay in place without pins, leave them in- but make sure they are PERPENDICULAR to hem-line-to-be, so, running up and down the length of the pantleg. You will need a needle of at least a 90 strength (the equivelant is, I think, a 14 in euro sizes). The thread doesn’t really make that much of a difference. You can buy Denim thread- the yellowy-gold stuff- but you can use any threat which is hard to break between your hands when pulling. Poly-cotton threads are good. Put the needle in. Thread the Machine. Put the setting to a straight-basic stitch, not too short, not too long– mid-range. If your machine can, put it so that the needle is not centered in the hole in the foot, but off to the left. Ok- visualize with me: machine in front of you. Pants laying on table to your Left. Put pants in machine, so that pantleg is to LEFT, and future hem is to your RIGHT. You want to position the pants so that the stitch is going to be on the LEFT edge of the hem. This ensures that the hem doesn’t unfold. Now sew! It’s best not to sew over pins, but if you do, do it slowly. Removing them right before you go over them works well, too. When you get to the seams in the pantleg, they will be thicker and the machine may not like them. So, when you get to that, you can either advance the stitch by hand, turning the wheel towards you- or you can stop the stitch WITH THE NEEDLE IN THE FABRIC raise the foot, and kida wiggle the fabric a bit- or you can combine the two. Just make sure you put the foot back down before you start to sew again. Remove all pins, clip off excess thread, and iron again. – if they’re too long– repeat whole damn process. – if they’re perfect, you’re perfect & you’re done!! Here’s Peggy’s Idea: just give her a small cut of it should you every make any money using her idea. if I were a robot, I’d like to think this is what I would look like.